With firm evidence that the majority of medication errors occur in the operating room, researchers are finally taking action. New research from the VA Pittsburgh Healthcare System published in the March issue of the Journal of Patient Safety discusses how the labeling of IV bags influences medication error rates. Participants in this study were made up of anesthesiologists and nurse-anesthetists. They were required to respond to an emergency administration of a drug, quickly locating it in the medication cart and properly administering it to the “patient” in a simulated OR setting. Unbeknownst to the participants, researchers had purposefully incorrectly stocked the medication carts. 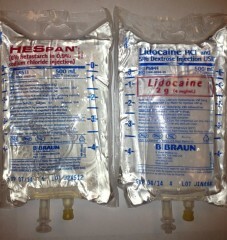 Half the carts were stocked with IV bags with the original labels (left), while the other half contained IV bags with reprinted, inverted labels featuring white text on a dark background (right). Following statistical analysis, the research shows that the odds of selecting the correct medication were more than twice as high with the redesigned labels. So what does this mean for our industry? Beyond the immediate indication that industry standards on medication labeling should be reevaluated, the study also forces us to consider how many other inefficiencies currently exist in our system. 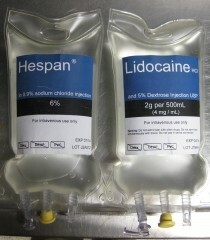 While medication labeling in the OR may be a small area to focus on, research on the ability to decrease medication errors at any level should be applauded. Following this study, what other industry norms should be questioned? What other commonly accepted status-quos should be reexamined in order to promote patient safety? Join the discussion by adding your thoughts below.